Grand (formerly Cliff) Hotel, Scarborough, by Cuthbert Brodrick (1821-1905). Grade II* listed building, built 1863-67 Image dated between c.1890-c.1900. Built of rich red brick (where it would not be blackened by city soot and grime) with warm terracotta dressings. This image, a photomechanical print: photochrom colour, comes from the Library of Congress Digital Gallery, Reproduction no. LC-DIG-ppmsc-09063. Text by Jacqueline Banerjee. Brodrick's work was almost all in Leeds: "only the enormous swagger of the Grand Hotel in Scarborough ... does anything to stamp Brodrick's character on other towns" (Cunningham 193). 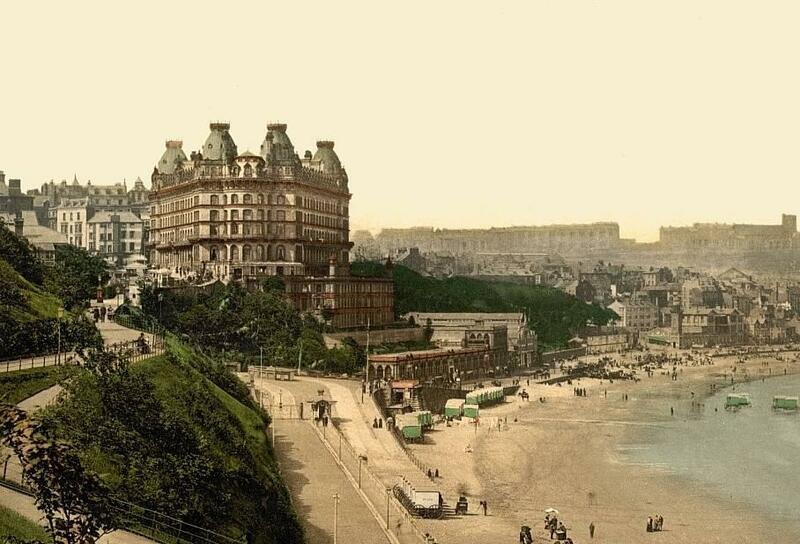 But here in Scarborough he had a wonderful site facing the North Sea and produced a truly outstanding building. The hotel has enormous presence and its domed corner pavilions give it a "spectacularly memorable skyline" (Curl 251). Like other grand hotels of the period it borrows much from the French Second Empire mode. Many were built at this time, but according to Henry-Russell Hitchcock this one "remains internationally the most notable example of the type" (233). Cunningham, Colin. "Cuthbert Brodrick (1821-1905)." Building a Great Victorian City: Leeds Architects and Architecture 1790-1914. Ed. Christopher Webster. Huddersfield: Northern Heritage Publications, in Association with the Victorian Society, 2011. 181-96. Print. Curl, James Stevens. Victorian Architecture. Newton Abbot: David & Charles, 1990. Print. Hitchcock, Henry-Russell. Architecture: Nineteenth and Twentieth Centures. 4th ed. London: Penguin, 1977. Print.